Description: Inspired by a nautical seashell marvel from the ocean deep, this sleek Muschel is so inviting that it may tempt you to hold it up to your ear. Designed to provide timeless character for any interior, the unique curvaceous diffuser is crafted of Solid Brass with an Antique finish and can be adjusted to a variety of heights to meet your lighting needs. A White finished support is attached to the Brass backplate for precision adjustment. 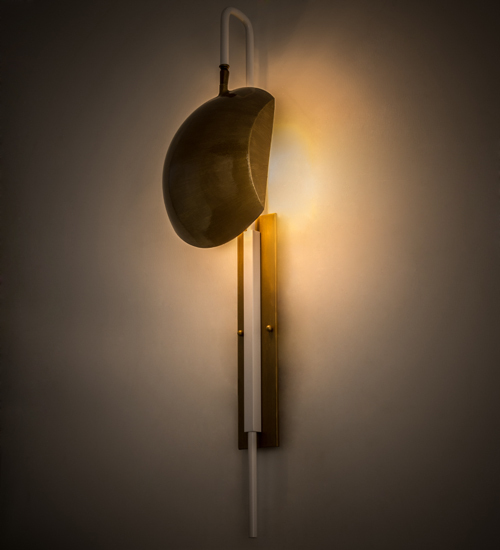 This unique wall fixture is available in custom designs, colors and sizes, and also with dimmable energy efficient lamping options. The fixture is UL and cUL listed for damp and dry locations. A minimum order of 100 pieces required.